Our range of products include 40 feet used flat rack shipping container, flat rack shipping container, 20 ft flat rack storage container, 40 ft flat rack storage container, 40 feet flat rack container and 20 feet flat rack shipping container. 40 Foot Flat Rack Containers. A 40 flat rack shipping container is a specialized high loading capacity container which is used for transporting oversized goods like machinery, industrial parts, steel coils, drums, vehicles and boats. 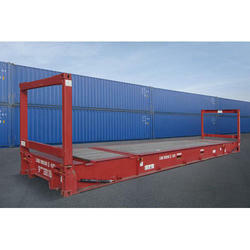 Flat rack containershave no roof and collapsible end walls. We are offering our customer a wide range of Flat Rack Shipping Container, which are manufactured from high grade quality raw material. 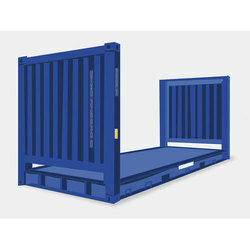 These Shipping Rack Container are good demand in the market due to high quality and durability. Flat rack containers are especially suitable for heavy loads and cargo that needs loading from the top or sides, such as pipes and machinery. You will find collapsiblecontainers and non-collapsible containers with or without walls. 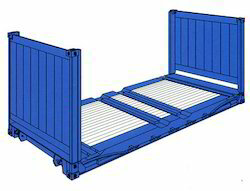 Flat rack containers are manufactured from steel and come in 20' and 40' sizes. 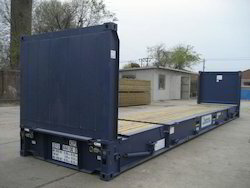 We are offering a wide range of Flat Rack Shipping Container to our valuable customers. These range are made by using best quality raw materials which have been sourced from the trusted vendors of the industry.